Warning: this could be you. Hydrate – this one may seem obvious, but few things are when you’re out for a long or challenging workout in hot weather. Hydrate (days) before, during and after your workout or race. Everyone is different, but I’ve found that sipping 4-8 ounces of water every 15-20 minutes during a run works well for me, and I shoot for 2 24 ounce bottles of fluid per hour on the bike. Need help remembering? Many fitness trackers include a time alert – my Garmin buzzes every 17.5 minutes and serves as a reminder that I need to keep drinking. Ice – this. Ice easily saved my race at Vineman 70.3 amidst the 90+ degree heat. I pour a cup down my tri top, toss some in my water bottle and also fill my hat whenever the opportunity presents itself. Regulating your core temperature has never been easier. 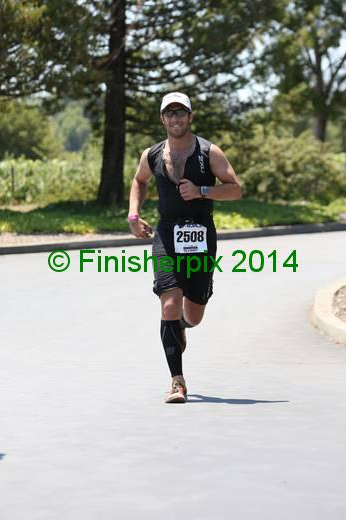 Running smooth and easy at mile 8 of the Vineman 70.3 half marathon. Hat – not visor: I prefer visors for most workouts, but warm weather workouts are all about the hat. Wearing a hat allows me to stash some ice cubes and soak it in cold water whenever I get the chance. Sponges – they’re not always easy to come by, but if you see them at an aid station, take advantage. I like to grab a few – one to wipe the sweat/salt off my face, one to cool down my armpits, and another to toss in my tri top for good measure. Carry a water bottle – even if you know exactly where the water fountains are on your go-to route, it’s always better to have more than less in the heat. I filled my water bottle at every aid station at Vineman 70.3 – all 13 of them. I made sure to grab cold water and also toss in some ice: I was able to drink half, and squirt the rest on my neck, chest, and wherever else was on the verge of overheating. Running down the finisher chute! Don’t forget about electrolyte replacement – the more you sweat, the more you need to remember electrolyte replenishment. Everyone has their own method – some people prefer salt pills, others reach for a sports drink; either way, do not underestimate the impact that electrolyte balance has on performance. Not sure whether salt pills or a sports drink would work better for you? Experiment during a long training day. I typically mix both depending on how my stomach feels. I recently tried Gu Roctane electrolyte capsules and was extremely pleased with the results. Wear Sunscreen! – Ask Taylor if you don’t believe me! 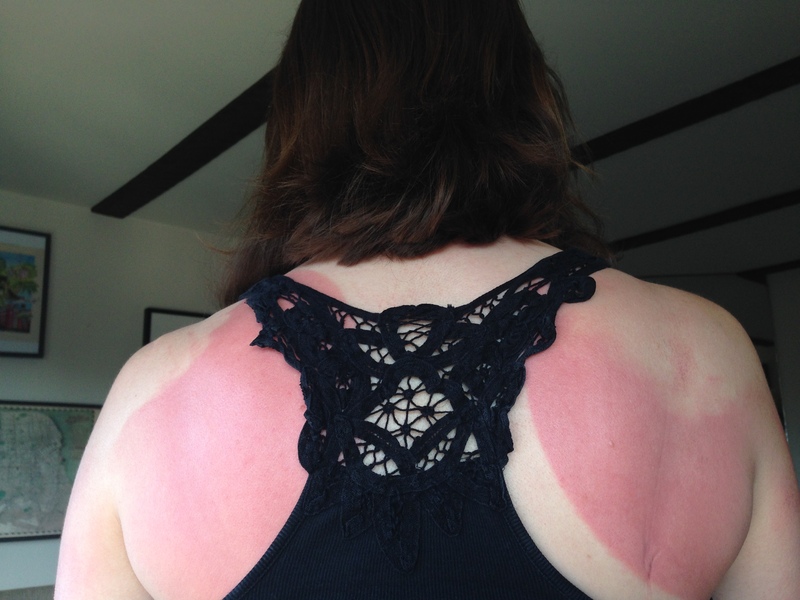 Both Taylor and I have suffered burns this season; I didn’t suffer like she did, but we just ordered Bullfrog sunscreen – known for its water and sweat resistance. What else works well for you guys? Other then wearing sunglasses, I can’t say I do anything different…I love sponges at a hot race. I usually plan my bigger races in spring/fall but still have see hot temps then too. Everyone’s different – you’re one of the lucky ones! Thanks for reading! Shucks, a little No-Ad 30, some Gatorade, H2O and one bottle of Perpetuem and I’m good. I skip the swim and the run though. Chuckle. After more than my fair share of warm Perpetuem on hot days, I can barely stomach it now. More power to you! No kidding! It’s never bothered me a little bit – other than the fact that it tastes horrible. I like what it does for the legs after a long pull on the front of the pace line. It’s so awesome I’ll live with the taste. My first negative experience was at Ironman Lake Placid: I left a 3 hour bottle in my special needs bag – my special needs bag that sat in the sun for the first 56 miles of the bike ride. I’ve had some really great results from Perpetuem but what ultimately made me switch was my run performance: it was giving me GI problems and I felt extremely full once I got off the bike. I’ve since switched to a different fueling strategy – I try not to drink calories on the bike. I eat Picky Bars, Gus and Clif Blocks and wash them down with either water or a low calorie sports drink like Osmo. I go with the hat too but I see others recommend going without it because it traps heat – I’m glad I’m not alone! Yep – I definitely think that having a hat that doubles as a wet cloth outweighs any potential downside. Thanks for reading! The heat got me on the run. I agree with all your strategies. I got a ‘miracle cooler’ thing that wraps on your neck. Evaporation cooling. Cheers. I signed up for St. George 70.3 for next year. Waddyasay? That’s a good idea – I also received one of those at an expo a few years back and stashed it in the closet somewhere; thanks for reminding me! IMSG is definitely on my list – I can’t say I’m not tempted, but as of now, I’m planning to run Miwok 100K the same weekend. It’s also a tough call because Wildflower and St. George are almost always the same weekend – we will see! Thanks for the invite! Did you see the WS100 coverage? Max King led the first 100K with a cowboy hat on. Don’t second guess yourself – just do it! I am always afraid I’m drinking too much water, but I follow the wisdom “if you feel thirsty, you’re already dehydrated” and drink when needed. The electrolyte replacement is more difficult, as I prefer water, and have never tried salt pills. I’ll look into this Gu Roctane. I have carried coconut water, which I found incredibly refreshing and comfortably filling when I needed something more than just water and Gu. You’re exactly right. Hyponatremia is a real concern, but you would have to drink a LOT of water at a hot event and neglect your electrolyte intake to put yourself in the danger zone. I couldn’t agree more – coconut water is one of our favorite drinks, and I wish more races would stock it. I’m similar, I overheat really quickly when working out. I love running in the winter, and unless its under 40 degrees, I’m in a tshirt and capris. Running in the summer is awful. I beat the heat by run/walk intervals to cool down, running early in the AM, lots and lots of hydration, and trying to find breezy or shaded locations to run. I haven’t tried a hat, but I might add that into the rotation. Those are also great tips – thank you for sharing! 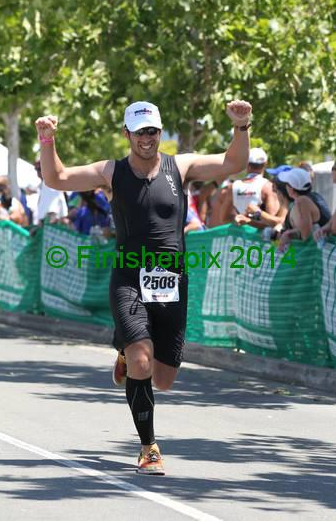 I should have pointed out that I almost lulled myself into a false sense of security during VM 70.3 by running in the shade for the first few miles – it really kept me cool! Yikes with the burn! My husband burns like that. I on the other hand walk outside for 5 minutes and come in with tan lines. It drives him nuts. Congrats on the awesome finish and excellent post! I’m in the same boat as you – it takes hours of direct exposure without sunscreen for me to burn. Hopefully the Bullfrog sunscreen works well – I’m sure Taylor will keep you posted! Thanks for the kind words! Thank you. It’s easy to focus on the race and neglect the supporting details once you’re in the zone. Thanks for reading! Thanks very much! Glad you enjoyed it. It’s been hot here the past month and I have not hydrated sufficiently a few times. It’s key to start a day or two in advance. Awesome, congratulations! Looks hot! I lived in Arizona for 10 years and we wouldn’t stop sports just because of the heat (or we would’ve spent 6 months indoors)… we still hiked / golfed / football, etc. For me the key was staying hydrated with extra sun screen, sunglasses, the wet hat trick is great, and for us – search for shade and take advantage when you can. Thanks for stopping by my page. Great post and congrats on the race! Great tips! Glad we’re thinking along the same lines.